Grab a drink and some grub downstairs and come lounge with us upstairs. Announcements at 8:00 PM. 2019 Meeting Dates: April 8, May 13, June 10, September 9, October 14, November 11, December 9. Stay tuned for details on the Cinco de Mayo celebration, kicking off Spring and Summer fun! Stay tuned for the first of two camping trips this year! 2018-2019 Season Almost Over – Check Out Past Trips and Stay Tuned for the 2019-2020 Season! This trip is full – contact Russ to be placed on the wait list. 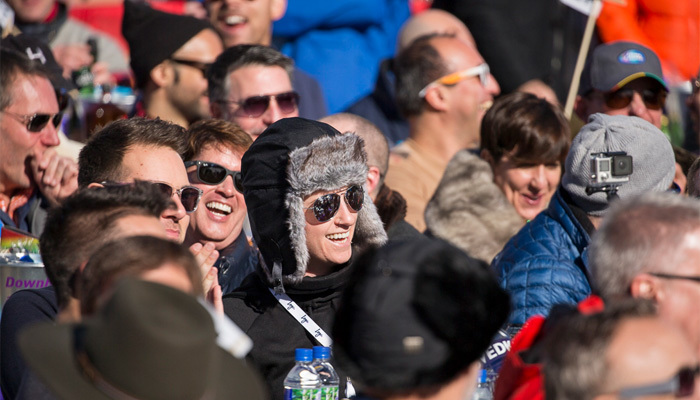 For 20 years now, SAGA SD offers one of the best ways to enjoy Aspen Gay Ski Week. We will be staying with SAGA LA at the Lift One Condominiums, which provide convenient access to the slopes, the apres-ski events (with HOT TUB!!! ), clubs, restaurants, and more! Ski on any or all of Aspen’s four righteous mountains – Ajax, Snowmass, Highlands, and Buttermilk, with Friday culminating in the downhill drag competition! The standard package includes 7-day (Saturday to Saturday) lodging, 5-day lift pass to all four awesome mountains, plus SAGA parties, with options to add Saturday night (stay for the infamous POOL PARTY!!!) and/or change the number of lift passes. Airfare and transfers not included. 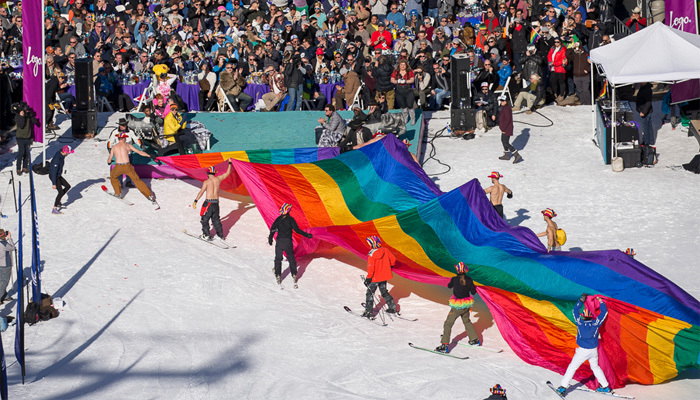 Just when you thought your winter couldn’t get any bigger and better – the 27th Annual Whistler Pride and Ski Festival offers one of the largest and best LGBTQ ski weeks in North America! We have secured beautiful rooms at the Aava Hotel – the HOST HOTEL for Whistler Pride – located in Whistler Village and a short walk to village restaurants, nightlife, and both Whistler’s and Blackcomb’s main gondolas. The package rate includes 7-days’ hotel lodging (based on double occupancy) for $1095. Single room options are available for a surcharge of $1095. Scenic round-trip transfers to and from Vancouver Airport for a separate charge of $138. For questions, email Leonard Whitney, the Trip Leader for this excursion. Total amount for 7-days’ lodging and round-trip airport transfers is $1233; full payment is due by December 15, 2018. Colorado’s “Last Great Ski Town” hosts one of the newest GLBT winter events at Crested Butte Resort where you’ll find some of the most beautiful scenery and plenty of North facing slopes that will excite all levels. We’ll be renting two houses, side-by-side, that are located a 5 minutes flat walk to the main resort base. There’s an outdoor hot tub to share, along with the killer views of Mt Crested Butte. The cost of just $300 includes 4 nights lodging (Wednesday Feb 20 – Sunday Feb 24 check out) as well as transfers from Gunnison Airport when staying all 4 nights. Lift tickets are not included (but free to Epic Pass holders). Combine Crested Butte and Telluride Gay Ski Weeks! You can add on either 5 or 7 nights in Telluride immediately after Crested Butte. A chartered mini bus is planned for transfers from Crested Butte to Telluride (a little over 3 hours drive). Pricing for Telluride portion below. “The most beautiful place you’ll ever ski!” Named the Best Small Town to Visit in the USA by US News 2018-19 and Best North American Ski Resort by Conde Nast, Telluride offers an awesome skiing and riding experience in the Rockies. A historic silver mining camp now sits at the base of dramatic red cliffs of the San Juan Mountains with the San Miguel River meandering through it. The steep rise – from a base elevation of 8,725 feet, to 13,150 feet – means awesome and scenic skiing! Open to skiers and riders of all abilities, come experience one of the most beautiful places in the Rockies! We are staying at the Cimarron Condos, in downtown Telluride. In addition to being Ski-in/ski-out, we are also within a few blocks of both Main Street and the Gondola. Another fabulous Telluride Gay Ski Week is in store! $760 for 5 nights Lodging (Feb 24 – Mar 1) and R/T transfers from Montrose Airport are included. $1000 for 7 nights Lodging (Feb 24 – Mar 3) and R/T transfers from Montrose are included. Lift tickets are not included (discounted tickets available at TellurideGaySki.com). The best skiing in San Diego’s backyard! Our trip occurs during Elevation Mammoth, the largest gay ski week in California! We’ll be staying at the 1849 Condos for 4 nights. The cost is $375 and includes SAGA party and dinner.